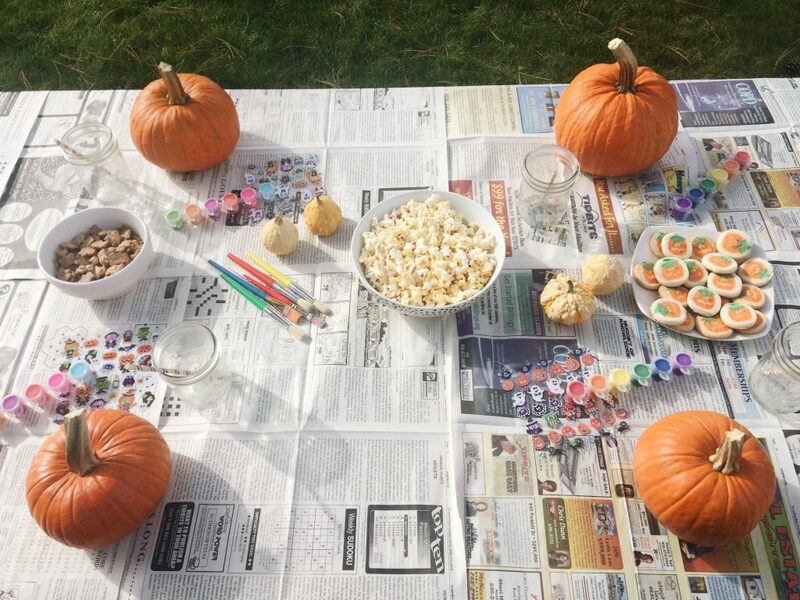 When I made our fall bucket list a pumpkin painting party was at the top. 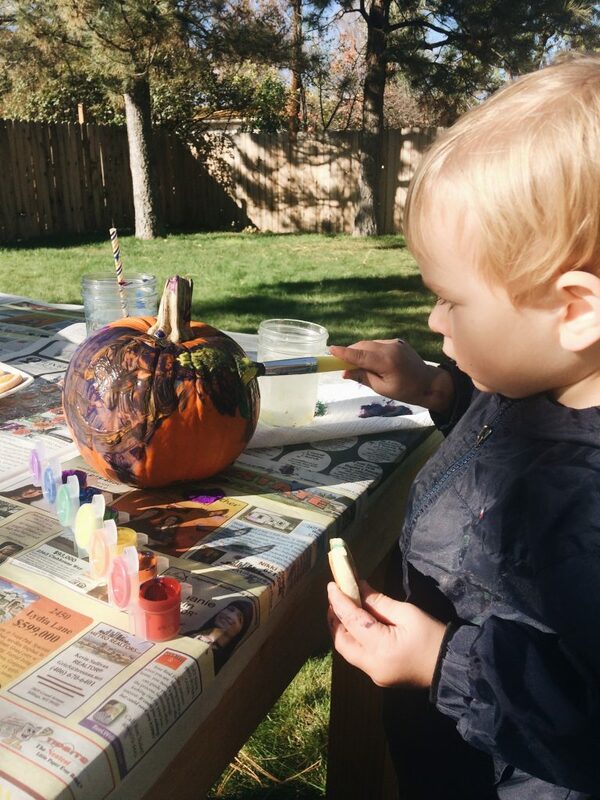 We started painting pumpkins with Kona, when I was pregnant with Kai, for an easy and festive craft. He loved it so much, that now we paint several pumpkins every year. 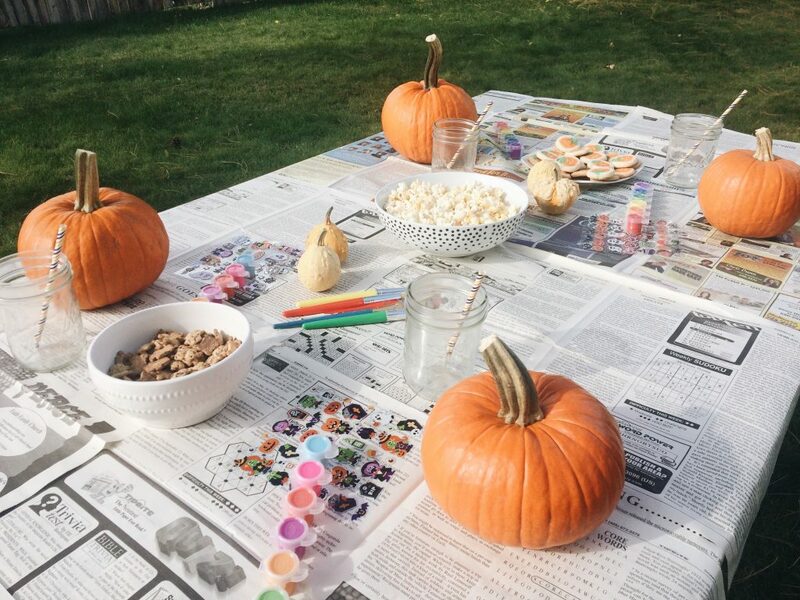 Last year we decided to start a new tradition and invited our favorite neighborhood girls over for a little pumpkin painting party. I couldn’t wait to introduce Kai to our yearly tradition, I knew he was going to love it! 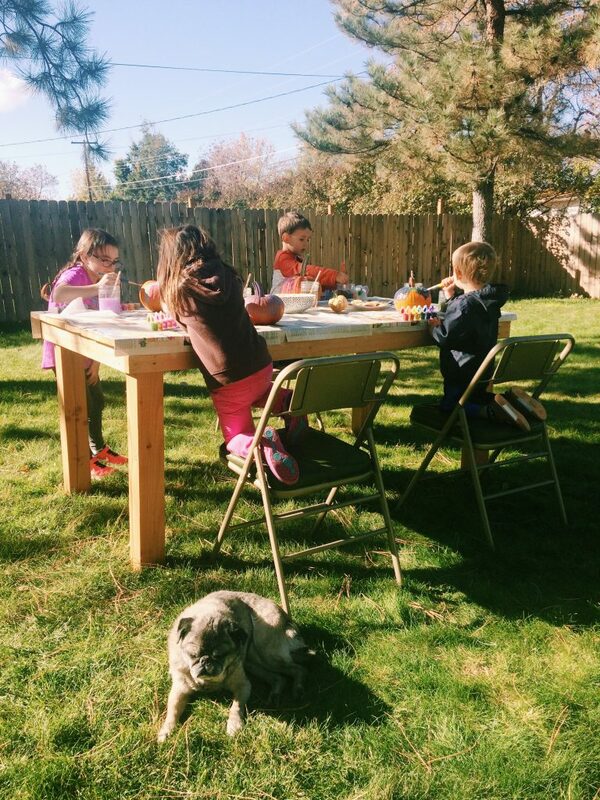 So, on a perfect fall afternoon, we got our painting on. I grabbed 4 smaller pumpkins when we went to the pumpkin patch, laid out newspaper on our outdoor farmhouse table, got some stickers, washable paint and treats.For snacks I made pumpkin cookies, popcorn and chocolate chip teddy grahams. I not sure how many cookies Kai had, but I know it was over 5 (enter monkey covering his eyes emoji here). Every time I turned around he was grabbing another one, talk about a sugar high! The kids had a blast and Kai loved slathering his pumpkin with as much paint as possible. 🙂 After they were done painting pumpkins a fake water fight broke out. I’m not sure who started it, but I’m pretty sure it was my husband. He was right along with them, chasing them and encouraging the craziness. It was a sugar high at it’s finest! 🙂 Thank goodness for husbands though, because Kery and I got to sit down and talk while nobody bothered us! It was a perfect afternoon! I look forward to painting pumpkins all year long. 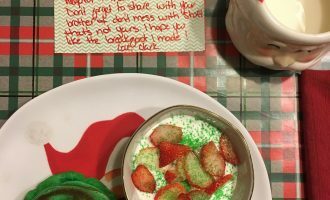 It is such a simple tradition that doesn’t take much effort and will keep your kids busy for awhile. That is a win-win in my book! If you are going to add this to your fall bucket list here are some of my tips. 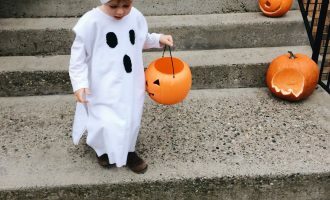 Make sure the stem on the pumpkins is long enough the kids can grab them to turn them around. Try and have the party outside for easy cleanup, but if weather pushes you inside put the pumpkins in a low cardboard box. That way the newspaper can’t move around on your dining room table or floor, inevitably getting paint all over. Get the individual washable paint. Easy clean up and nobody is going to ruin their clothes. 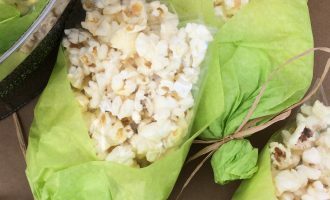 Put out some easy festive treats, treats make any craft project last a little longer! Finally, make sure you and your girlfriend have a glass of wine or a White Claw! 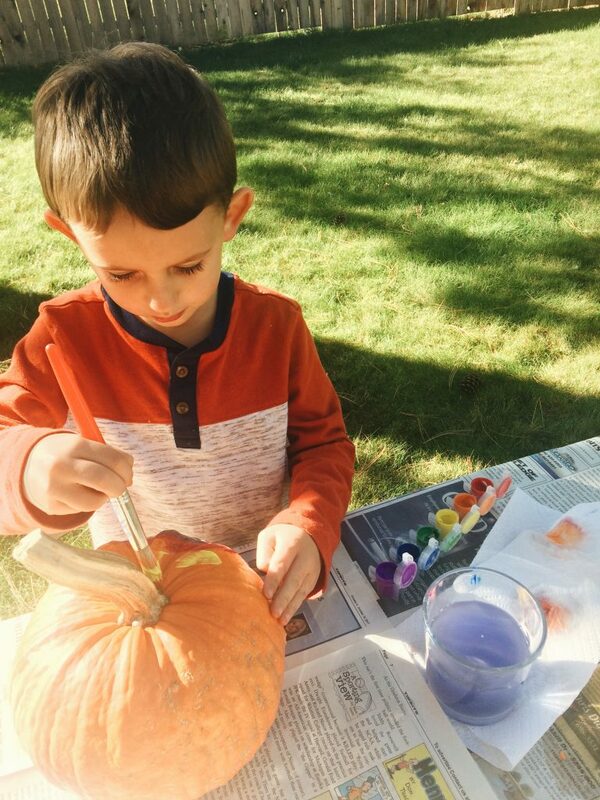 I would love to hear about your favorite fall craft, I’m always looking for new things to try with the boys! 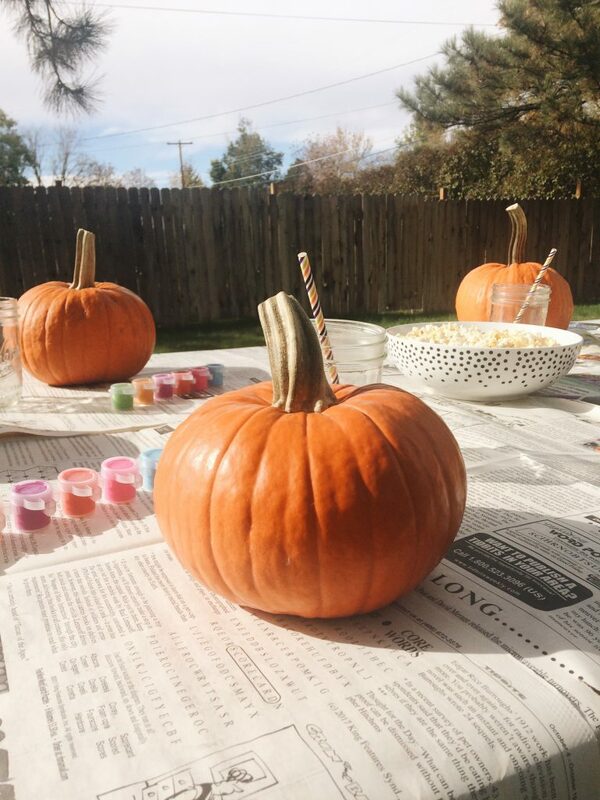 If your little ones get their pumpkin painting on make sure to tag me on Instagram, I would love to see their creations! I will also be sharing some pumpkin painting inspiration on my Instagram stories today so make sure to check it out!